TOWAMENCIN >>As it heads into the final stretch of the season, the North Penn boys basketball team has one goal in mind to keep its playoff hopes alive: just keep winning. The Knights won every quarter Friday afternoon en route to a 59-50 Suburban One League Continental Conference victory over Quakertown. “Every win is a good win for us (at this point of the season),” North Penn head coach John Conrad said. North Penn improves to 8-10 on the season and 3-7 in the conference with the win. The Knights were led by Lance Lindsay-Ford and Reece Udinski, each of whom had 14 points on the afternoon in two very different ways. Lindsay-Ford had four 3s in the game, while Udinski did most of his damage at the line, where he went 10-of-11. “Lance had a couple of ‘no, no, yesses’ there. 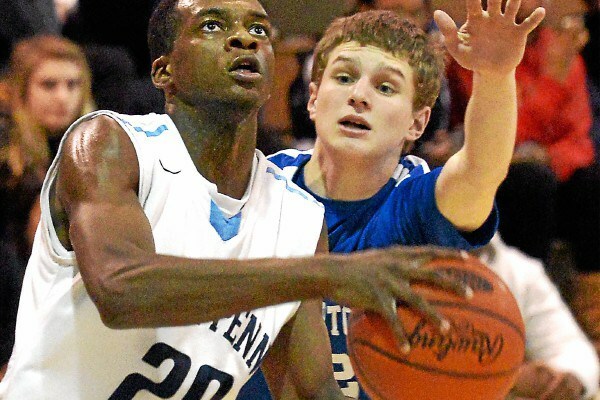 A couple of ‘no don’t shoot it’ and then it goes in,” said North Penn coach John Conrad of his junior forward. “He’s really played great for us all year. He can step out and shoot it, but he can also play with his back to basket. Udinski made two free throws to give North Penn a 59-49 lead with under a minute to play and put the game out of reach. After heading into the locker room with just a three-point lead, North Penn came out in the second half with a winning mentality on the defensive end, holding Quakertown to 24 second-half points compared to 30 for the Knights. Although they never led by more than 10 in the game, North Penn took a 12-11 lead late in the first quarter it never relinquished. Despite the fact North Penn led for most of the game, the opening 16 minutes were tight throughout. Lindsay-Ford connected from deep on three occasions to pace the Knights with 11 points in the first half. Udinski did most of the work on the inside for North Penn, scoring eight points in the first half on the back of a 6-6 performance at the line. Udinski also put in a layup as time expired in the first half to make the score 29-26 North Penn. Griffin Schmidt seemed to get a shot every time down the floor for Quakertown (5-12, 1-9 SOL Continental) in the first half. The guard finished with 21 points in the game to lead all scorers. The Panthers scored multiple times by anticipating North Penn passes and scoring in transition. JR Grimmage, who had seven points in the game, pulled Quakertown to within 27-26 with a steal and score, but that was as close as the Panthers got in the final three quarters. The Knights were without both Ricky Johns and Matt Pickford, who are nursing hand and hip injuries, respectively. “We had a lot of guys play, and we were a little sloppy, but a wins a win,” Conrad said. North Penn looks to win its third game in a row at Central Bucks West — which is tied with Pennridge for first in the conference — Tuesday night.